AA6E Station Log: Whatever became of Eimac? In my recent post, I reported some measurements on the power tubes (Eimac 3-500Zs) in my SB-220 amplifier to see if they still were serviceable after ~45 years. (Mostly, yes.) But this started me to wonder about the "Eimac" name, which, though once the gold standard, has largely disappeared in the Amateur Radio market. With the help of DuckDuckGo, I was able to trace a long corporate history, starting with the original Eitel-McCullough company (1934), which became Eimac. Then, a merger with Varian Associates, ending up as a part of Communications and Power Industries (CPI). Eimac is found in high-end markets for commercial, industrial, and military transmitters. Glass has given way to ceramic for insulating seals, while external directly cooled anodes are the choice for efficiency and performance. "Low end" Eimac tubes (triodes and tetrodes that are effective for our 1.5 kW power levels) may still be produced in low volumes, but they will be very expensive compared with glass envelope imports for our ICAS operations. 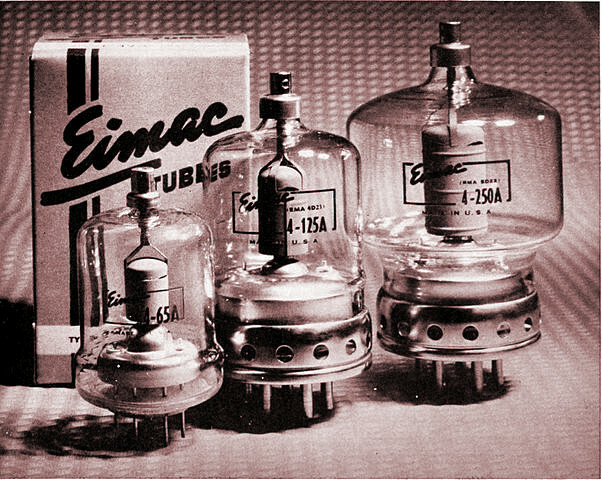 Over recent years, the old vacuum tube technology has been replaced by solid state designs, especially for commercial service. So there is little demand for the kW size tubes. Still, it's much cheaper to keep an SB-220 going with new imported tubes if needed, than to upgrade to the latest transistor amps. Your reward for reading this far! CPI provides a library of some of the older Eimac applications support documents. I found "Care and Feeding of Power Grid Tubes" especially interesting. So here are some links to the PDF files. The basics will be interesting to ham operators, especially those of a certain age. The advanced sections cover some fascinating large and exotic transmitting tubes that most of us will never see. Care and Feeding of Power Grid Tubes: Section 1 & 2 - "What is a Power Grid Tube?" Care and Feeding of Power Grid Tubes: Section 3 - "Electrical Design Considerations"
Care and Feeding of Power Grid Tubes: Section 4 - "Linear Amplifier and Single Sideband Service"
Care and Feeding of Power Grid Tubes: Section 5 - "Neutralization"
Care and Feeding of Power Grid Tubes: Section 6 - "Operating Conditions for Various Applications"
SB-220 Amp, need new tubes?